Love it. I like the light colors. My scrappy trip has very dark colors. I really like the backing. Perfect! I love it Nanette! Your fabrics, even the scraps, are always so happy and bright. This Scrappy Trips looks very vintage. Just lovely! Oh, I just love the softness of this Trip quilt - so different from all the others I have been seeing. Just love it - and love the backing fabric too. I love it, too, Nedra - hey, you've got a fabulous stash to work with. You are tempting me again, lol! Beautiful! Great job on this! I love the addition of the low volume in between the contrasting colors! What a beautiful quilt, Nanette. I agree, it is perfect for a guest bed. Your Scrappy Trips boring??? I think not - it's wonderful, Nanette. Nothing you do is boring! It turned out beautiful! I love your colors! LOVE. IT. Nanette! Those are the best quilts. The ones you can look at forever, discovering all the fun fabrics! You did a fantastic job with the scrappy trips, Nanette! I would have panicked in this situation. But yours is too beautiful and lively with fun fabrics! I love the soft blue flower backing and red binding. Everything is in perfect balance! You get an "A" for adorable! What a beauty! Fun to see all the great fabrics you work with. That's why scrap quilts are my favorite. I love it. 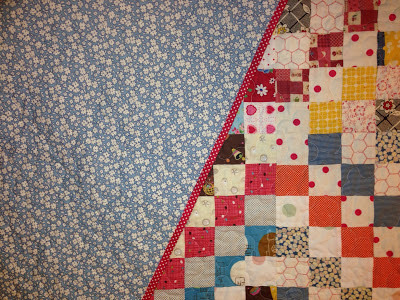 I love scrappy quilts . This is one of my favorites I have seen. Love the fabrics and colors. Very nice. I love it so much Nanette! I'm so jealous yours is finished! 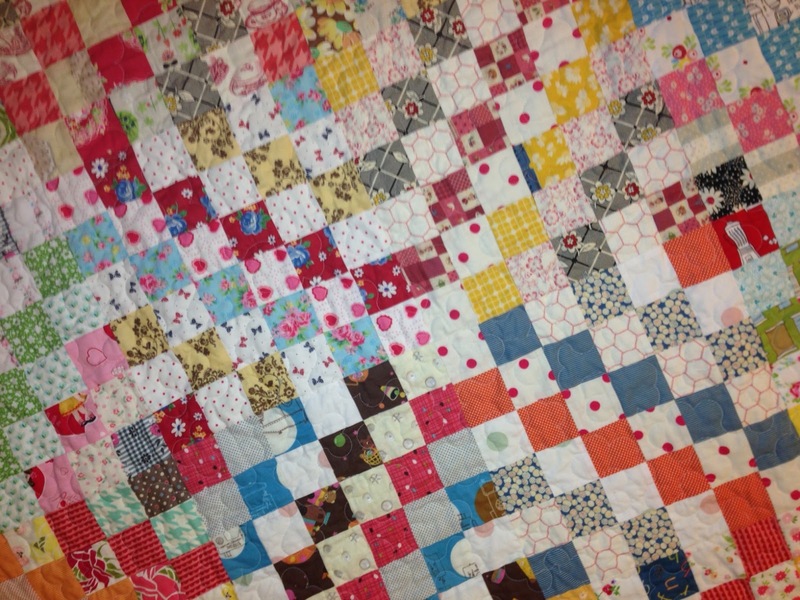 This quilt is so not boring!! It is beautiful. Thank you for sharing! Show as many pics as you want...it is beautiful and I just love it! Well done for hand stitching binding on too...it would never happen in my lifetime so applaud your dedication!!! It will look lovely on the bed...very welcoming! It is a beautiful quilt - well done! I have been wanting to do a scrappy TATW in a long time, but just have so many others to finish first. Not boring at all Nanette. 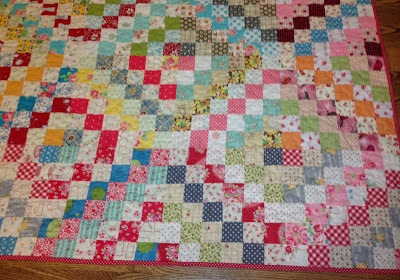 I love it too..scrappy quilts are the best. Love how the trips stand out with your colour placements. It is perfection - nothing boring at all about it! I love it. And that is my favorite kind too - lots to see and a surprise every time you look. Great job. I NEED to make one! Hi Nanette! 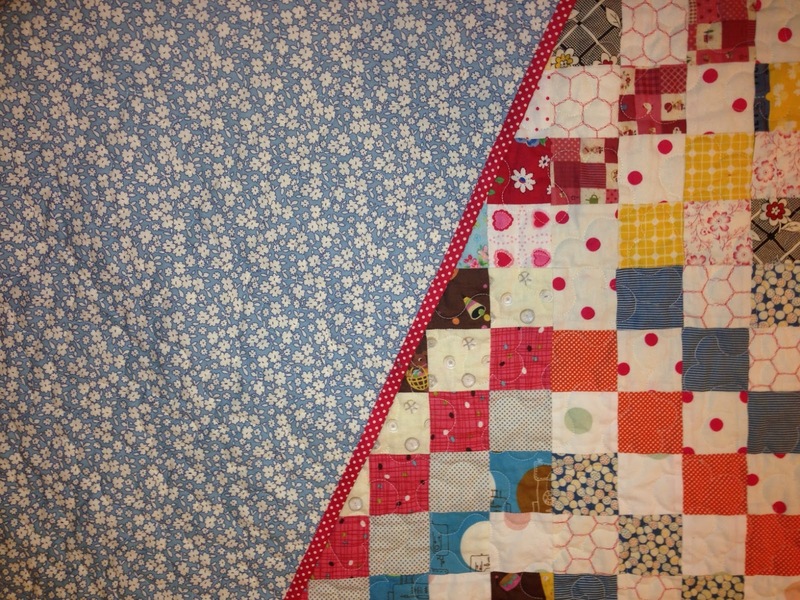 LOVE this quilt with the blue back & red binding. Nothing boring here to me. 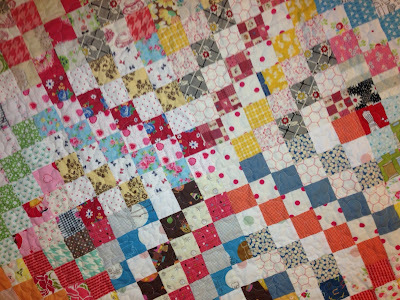 Love quilts where you can look at different fabrics & smile. Great job! love it. I need to make more blocks for mine. It's the kind of quilt I love, too. Great job! Love your scrappy trip! Not a bit boring at all! so in love with this quilt! I love all of your creation, but this is one of my favorites! Though I have seen thousands of quilt patterns the Trip Around the World ones remain dear to my heart. It is so very beautiful, great job! You are an inspiration. you did a great job!! love it!! L.O.V.E. it!!! Nothin' boring about it... it's gorgeous!!! Wow, this is absolutely beautiful. Nice job! It's so beautiful! I'm so glad you posted it...I could look at it again and again! I love it! It is really beautiful! I have yet to make one myself. I really like the colors you used. Oh no it is not boring at all! I love it, so big and fun. Wonderful! My kinda quilt! Love it! It is soooooooooo wonderful Nanette! LOVE it! This quilt is anything but boring. I love it! I really like the way it feels like a scrappy quilt, but the way you've used the color values in it make the pattern really pop. Wait, did you say another scrappy trips quilt?! I can't wait to see that one too! 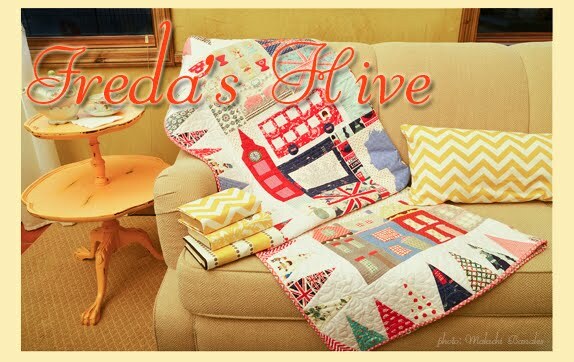 I love your quilt, Freda. The lights and whites make it look softer. So many possibilities with this pattern. 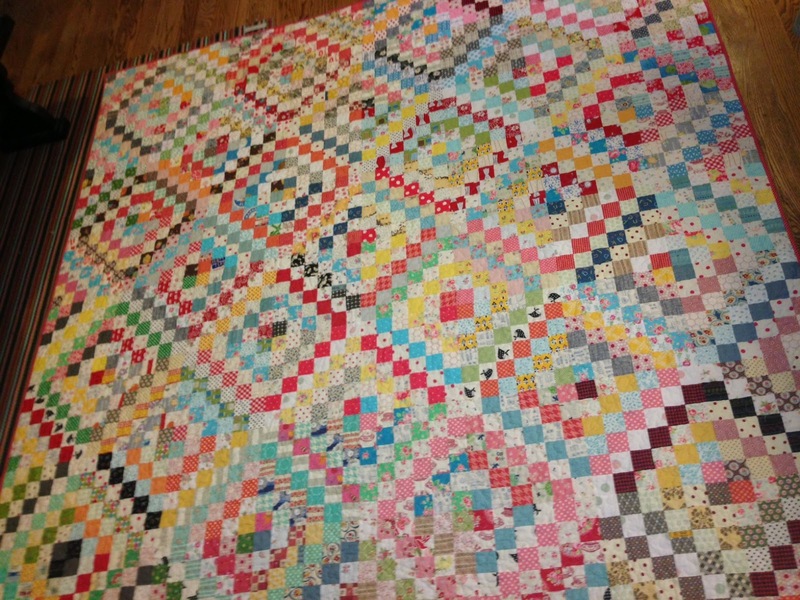 And each quilts using this pattern is so interesting, colorful and wonderful. I am so jealous yours is finished. I have my flimsy but haven't found the backing I want to use yet! I haven't started mine yet. I love the lightness of yours. So every other strip must have been a light. Beautiful! 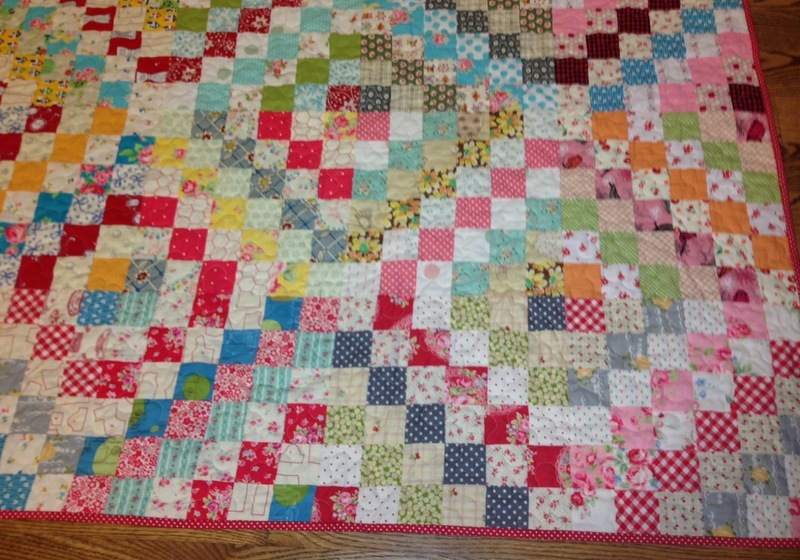 A beautiful and sweet quilt. Thanks for sharing. Not even close to being tired of seeing these - I've got three of my own now! Well, not exactly completely scrappy, but scrappy enough for me. Lovely job! Can't wait to see the next one you've got! Wow... I LOVE this one! 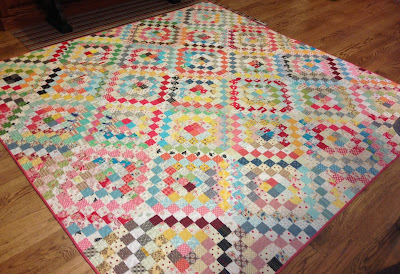 Scrap quilts in patterns like this are some of my favorites to look at... you can keep looking all day and always notice something new. Oh it is fab! It has real sparkle and will brighten any room! Congrats!! Your scrappy colors are perfect! Your scrappy trip around the is gorgeous. I spy polka dots on the binding. Soooo cute. it's definitely not boring to look at. It's gorgeous! 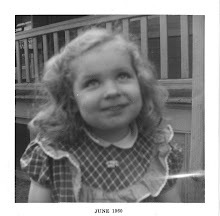 Is this from Bonnie Hunter's blog (free patterns?)? I just made the Scrappy Bargello as a wedding gift - like the one you did much better! Bonnie was here in St. Charles and Jane's Fabrics and I enjoyed her very much! Love you quilt - by the way!!! It's beautiful! 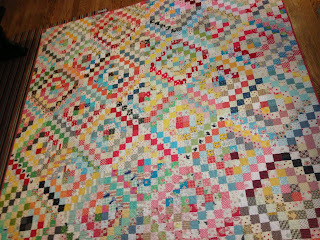 I love scrappy quilts, too. OMG I love this so much. I haven't made one of these, mostly out of laziness. I love how wonderful they all are. I wish the cutting elves would come over and cut me a bunch of strips. That would help.